Hello. We are Jing Zhang and Haibin Zhu, Owner and Director of Mathnasium of North Bay, your neighbourhood math-only learning centre. We help kids in grades K-12 understand math by teaching the way that makes sense to them. 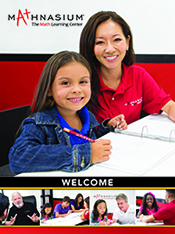 Mathnasium of North Bay has been offering math tutoring and homework help to hundreds of students in the North Bay area and surrounding communities since 2012. Our expert math staff is passionate about helping kids improve and excel in math through our year-round and summer math program, as well as our math contest prep for the University of Waterloo Math Contest. Mathnasium of North Bay is a member of North Bay and District Chamber of Commerce. Our centre is located at the Hillview Plaza, just across the street from Odyssey Secondary School. Call us today at (705) 491-0915 for a FREE consultation and see how we can help your child! Good program, good instructors, good environment. Great teachers and flexible with our schedule. Now my daughter is getting great grades in math. Thank you! Good teaching methodology! Good instructors! Good materials. Good environment! The educators are very professional and passionate about Math, it has been a great experience. Jung and her staff are so welcoming, positive and motivating. It is easier to do homework with my child. She is happy when she has math to do. I am very happy with the math support that my children receive from Jing and her staff. Mathnasium is an excellent program run by professional and dedicated people. My kids are always working ahead and have less worry during the school year due to the confidence gained at Mathnasium. The quality of assistance my son received was second to none. The staff always took the time to update us on his progress and provided suggestions to assist him in learning the concepts that were discussed. thank you for your assistance and direction. Cody's experience at Mathnasium has been excellent. His confidence has grown and he is prepared for post-secondary education. Thank you for all of your help and support throughout the years. Mathnasium has truly changed Cody's feelings toward math and has helped him develop effective math skills and strategies necessary for future learning. I’m glad I put my daughter here. She likes it too. The centre has excellent highly qualified instructors. My children continue to learn a great deal about number concepts and have improved their depth of understanding. They have a heightened interest all things math! We are truly appreciative of the rich math learning experience being provided at the north bay Mathnasium. Thank you! My son loves the challenging and learning environment at Mathnasium. He always want to attend his classes. Thank you for making my son love maths. We started a month ago and we like the service we are receiving. The children are doing more challenging work. It would have been nice if Mathnesium provide for language as well. Overall, very good so far. The program really helped my son get up to speed with his math skills. I found the schedule to be very accommodating to his and our busy schedule. His confidence in math went way up. I would recommend this program for sure! Hunter has benefited greatly! Thank you to all! [NAME REMOVED]. Excellent assessment and individualized learning plans for students, Very effective teaching strategies that build on students' strengths and address their learning needs. My daughter is getting more confident in her mathematics abilities. I think she needs more help with understanding the words in the question. I know this is for math help but when reading is involved in the math question I think it's important to help the child understand and help them with the reading portion as well. She loves her Saturday morning's at mathnasium! The math skills that you are teaching are going to help with your everyday tasks when you are an adult. You are teaching the students the proper method of solving problems and will learn the method of solving without the use of the calculator. My daughter loves math and is more confidant and eager then ever before. One of the things I appreciate the most is that she enjoys going to her mathnasium sessions! She has on occasion even asked to have 2 hour sessions rather then 1! We have already recommended Mathnasium to friends. Our daughter's math confidence is growing and growing. She is proud of how far she has come in such a short period of time. My daughter started at mathnasium at the beginning of July and has felt very comfortable from the very start. She has gained her math confidence back and is actually feeling like she is capable of doing math. The tutors have been able to explain concepts to her in a way that she is understanding. My children are learning. They have great experiences at Mathnasium. The teachers are invested in the children. They care about them, praise their efforts, and make sure parents understand where their child is at academically. Even though Ethan gives me grief for sending him over the summer, there is improvement. He is becoming more confident with math, and feeling less frustrated. My daughter has been going to Mathnasium for two years now. I have seen her marks and confidence increase dramatically. The teachers are great and I really appreciate the flexibility of hours when needed. My son has been attending Mathnasium twice a week for the last month. It has been a positive start for him. He seems more confident and is less frustrated while doing math. Truely the best math learning in North Bay! The most important aspect of the program is the flexibility of hours offered to the student. The one on one help offered to the student when identified was great. I would highly recommend this program.